As we described in How To: Get Basic Business Software, Microsoft Office is the gold standard of desktop application suites. So it comes as no big surprise that Microsoft also offers a compatible cloud computing product worthy of our attention and dollars. It’s called Microsoft Office 365. You can purchase this as a standalone service for $4/user/month or as part of the Small Business plan starting at $6/user/month or $60/user/year. The biggest difference between Google Apps and Office 365 is that, well, one is Google and the other is Microsoft. 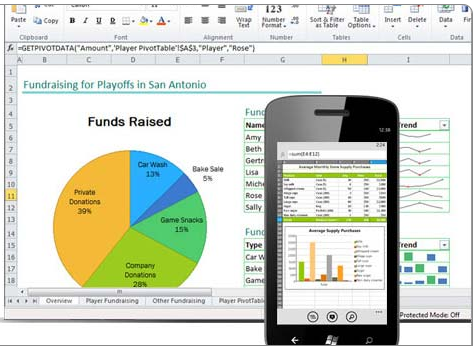 On one hand, Microsoft Office software has superior functionality to any of Google’s office apps (although they’re constantly improving)- especially when comparing Excel to Google’s spreadsheet app. However, Google’s web apps are more user friendly than Microsoft’s web apps (which are quite limited compared to their software counterparts), and they offer the ability to collaboratively work on a single doc from two different computers at the same time. This can be really useful, if you have multiple people adding to or editing a single list. Another consideration is integration. Google and Microsoft are competing for customers, so they are making it harder for people to use both systems together. For example, Outlook 2013 wasn’t compatible with Google Sync (the tool that allowed a person to sync Outlook’s contacts and calendars with Gmail), and Google didn’t get around to fixing this issue until the end of May 2013. If you are committed to Outlook, the safer bet would be Office 365. Google Apps has discontinued their extremely popular free version, so the price difference for the entry level services is very similar. Google Apps for Business starts at $5/user/month (or $50/user/ year). In contrast, Microsoft Office 365 starts at $6/user/month (or $60/user/year). Google Apps allows an unlimited number of users for their entry level plan, where Microsoft forces businesses needing more than 25 user accounts to upgrade to their “Midsize Business” plan, which is $15/user/month. However, the Midsize Business plan also includes full desktop versions of the entire Microsoft Office suite. Tip: If you’re looking for a free hosted business email account, you can try Windows Live Admin Center. It’s the first tool on our Free Web Tools For Your Small Business list. Both Google Apps and Microsoft Office 365 are high quality cloud services, but they boast different strengths and weaknesses for people starting a new business. If you’re planning to purchase Microsoft Office software for each of the employees for whom you plan to get email addresses, and you intend to use Microsoft Outlook for your email, contact and calendar management, then Office 365 is likely the better fit. If, however, you don’t use Microsoft Outlook and you are perfectly happy using Google’s applications rather than Microsoft’s Office Suite, then Google Apps is going to provide a far less expensive, high quality service. @Leo Great question. Microsoft Office 365 integrates seamlessly with all current desktop Office products. You can open and edit files created on your desktop Office in the cloud, and vice versa, without losing any formatting. I’m not sure if you can sync the two, but from what I gather it should be easy to transfer docs back and forth. Very cool alternative. How well (if at all) does Microsoft Office 365 integrate with the desktop Microsoft Office products?